Journalist Saikat Datta, who is South Asia editor of Asia Times and formerly covered National Security for Hindustan Times, today posted a screenshot of a Facebook profile of a girl ‘Sanjana Singh’. 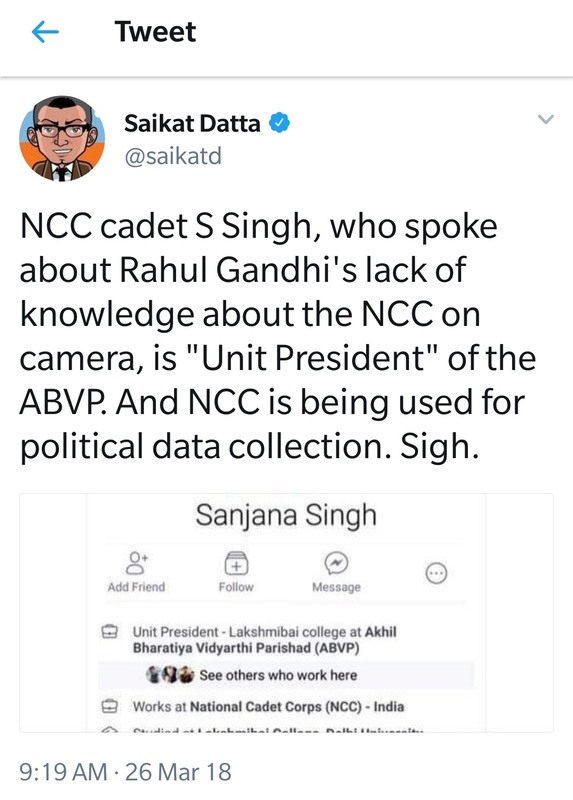 He claimed that the profile was of same NCC cadet interviewed by news agency ANI after Rahul Gandhi claimed ignorance regarding NCC training ‘and that type of stuff’. However, even a cursory look at two pictures, of the Facebook profile shared by Saikat and the picture of the NCC cadet, would reveal that the two women aren’t the same. 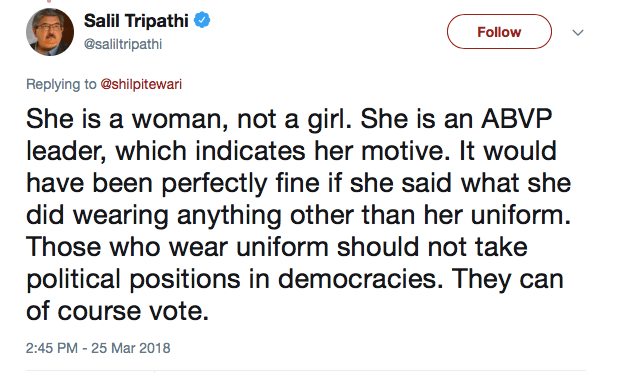 Another ‘journalist’, Salil Tripathi, went on to further that lie accusing the NCC cadet of wearing the uniform while trying to score political brownie points. He also went on the to do some ‘mansplaining’ and justified hounding the NCC Cadet because she was a “woman” and not a “girl”. 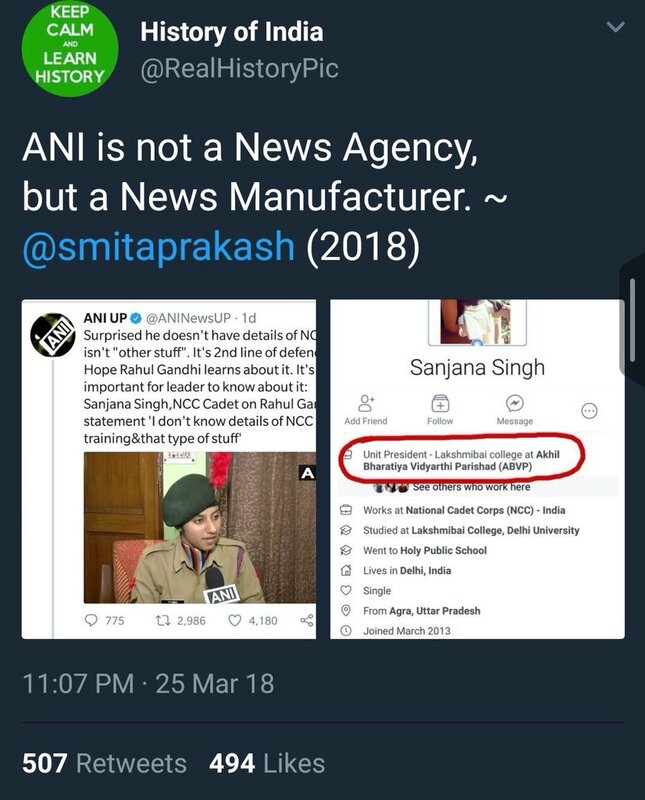 Saikat Datta deleted the tweet after multiple people pointed out that the profile is not the same of the girl who was interviewed by ANI. Interestingly, a so-called parody account, ‘Real History Pic’, had also shared the same screenshot of the same girl last night. Yesterday we had reported how the so-called journalists turn bullies whenever someone asks an uncomfortable question to Congress President Rahul Gandhi. Hence, when a screenshot of a Facebook profile, posted by a propaganda account masquerading as parody and a ‘journalist’ appear very similar (just the image of the girl is cropped), doubts are raised if the image is shared by the same source. This is not the first time someone has shared a fake image to score a political brownie point and then deleted it after spreading the misinformation far and wide. Politician and lawyer Prashant Bhushan, who was a part of Aam Aadmi Party (AAP) before Kejriwal removed him from the party had shared an unverified image with wrong information. Later in September last year, ‘journalists’ and politicians had shared fake images of girls beaten up by police in BHU. It appears like a shoot and scoot pattern is an easy way to spread lies and fake news without responsibility. At a time when tweets and screenshots of tweets which contain fake news and rumours can easily be shared over social mediums like Twitter, Facebook and WhatsApp, people in influential positions should be all the more mindful of ensuring they don’t reveal personal details and endanger lives of citizens.